‘Urgent change’ is needed to stop recyclable and biodegradable material from being incinerated in London, as energy-from-waste hinders the capital’s move to a more circular economy, according to the London Assembly’s Environment Committee in a report published today (15 February). The amount of waste being sent to incineration or energy-from-waste (EfW) facilities in London has more than doubled in the last decade, according to the ‘Waste: Energy from Waste’ report, totalling nearly two million tonnes last year. This represents 53 per cent of local authority collected waste in London. This figure corresponds with a dramatic fall in waste to landfill, as highlighted by the Environmental Services Association (ESA), which said it was “perplexed” by the report, but the Committee’s report says that levels of incineration in the capital show no signs of slowing down and that the cost of incineration is acting as a disincentive to recycling and other sustainable uses for waste. EfW development has been a hot topic over the last year as disagreements over the UK’s impending lack, or excess, depending on who you believe, of residual waste treatment capacity have reignited. Eunomia Research and Consulting maintains that by 2020/21 the UK will have too much incineration infrastructure, with the potential outcome of recyclable materials being sent for incineration to fulfil quotas. However, a number of waste management firms, as well as the ESA, which represents waste companies in the UK, have released contradictory studies that conclude that unless greater investment is made in EfW facilities, the UK faces a capacity gap, with the country creating more waste than it can deal with. The London Assembly report notes one such report by waste firm Cory, which operates the huge, 750,000-tonne capacity Riverside facility in East London, in which the company predicted a capacity gap of up to 1.7 million tonnes by 2030. However, it notes that this report assumes a recycling rate of 54-60 per cent, while the Mayor of London has set a recycling target of 65 per cent for the capital by 2030, which it says would leave an excess of residual waste (that target would require a huge step-change in urban recycling, as London currently reports a recycling rate of 33 per cent). At present, the report states, despite four EfW plants being situated in the capital, London exports 7.3 million tonnes of its waste to other parts of the UK and abroad, with almost half a million tonnes of waste being sent to Europe for incineration. Its conclusion from this is that London needs to ‘become self-sufficient’ in managing the waste it generates, reducing waste sent to EfW as population grows. Investing in more EfW, it says, will ‘negatively affect long-term recycling rates’ as long-term waste disposal contracts can ‘undermine the financial viability for the local authority of reducing waste, or sending it to other destinations such as recycling’. As well as encouraging a rethink over incineration, the report looks to council recycling services to improve to prevent recyclable material from being wasted. Not all boroughs offer separate food waste collections, it says, meaning food waste is being put in bins rather than being sent to compost, and while London’s incinerators are booming, its anaerobic digesters are ‘under-utilised’. Leonie Cooper AM, Chair of the Environment Committee, said: “We have got to get a grip on the amount of waste being sent to incineration. Burning recyclable and organic materials is wasteful and potentially harmful and as London is expected to grow, we urgently need to reduce the amount being sent for incineration and to separate out useful materials. Once these materials are burnt, they are lost forever and can’t be used within a circular economy. The report, the third produced as part of an investigation by the Environment Committee into waste management (the other two looked at the circular economy and household recycling levels), does not contain any hard policy recommendations, but simply highlights the perceived issues of levels of incineration in London. A final report featuring all three topics will be sent to the Mayor in the spring. Following the report’s publication this morning, the waste industry has been predictably keen to defend the use of EfW for London’s waste, denying that it stands to hold back a transition to a sustainable, circular economy. “EfW has an important role to play as we transition to a circular economy. The increase of the amount of London’s waste sent to EfW in the last decade is a success story,” said ESA Executive Director, Jacob Hayler. “This is the waste left over after recycling which would otherwise be sent to landfill. Instead it has been put to a further use to generate low-carbon electricity and heat for homes and businesses in the capital, thereby upholding the principles of the circular economy. “It is incredibly disappointing that the London Assembly Environment Committee has overlooked this. We are perplexed how the Committee sees EfW as a hindrance to recycling. And we are baffled how the report so readily highlights the treatment capacity gap in London while simultaneously criticising EfW operators and offering nothing in the way of solutions. 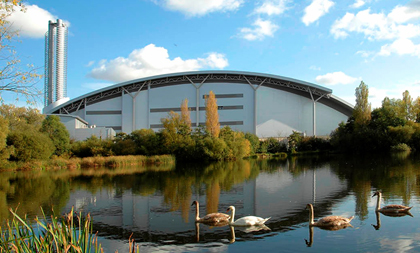 The Lakeside EfW facility situated just to the west of Heathrow is one of the four sites serving London. Running since 2010, it processes over 450,000 tonnes of residual waste every year, including that collected by councils in the West London Waste Authority. The London Assembly Environment Committee’s ‘Waste: Energy from Waste’ report can be read and downloaded from the committee’s website. Eunomia Research & Consulting has released more figures in defence of its prediction that the UK would reach an overcapacity in residual waste treatment infrastructure by 2020/21 in response to criticism the ESA.